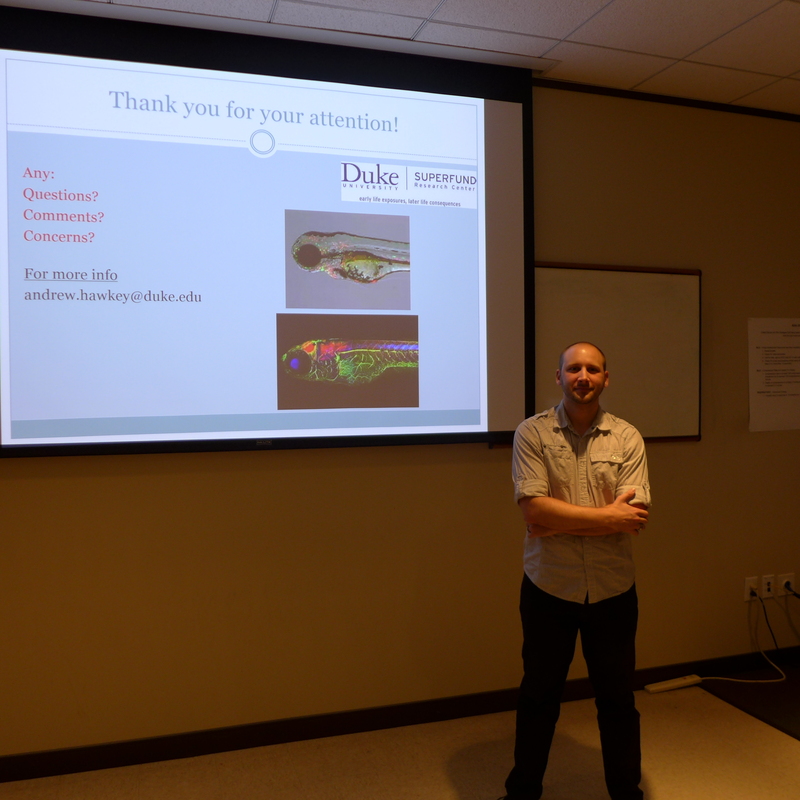 Earlier this fall, a group of science teachers from NC schools came to Duke’s campus to take part in a workshop series with the North Carolina Association for Biomedical Research (NCABR). This series gives teachers a chance to meet specialists in the biomedical sciences who share experiences and insights from their work with the goal of translating cutting-edge science to teachers for the benefit of students across the state. I accepted an invitation to speak at one such workshop, entitled: Exploring Bioethics. In my talk, I aimed to lay out a thoughtful explanation of what it means to do animal research ethically and responsibly. Moreover, I hoped to give the teachers an honest account of how ethical standards inform my decisions about research design. The afternoon lineup of speakers included a clinical researcher, a member of Duke’s Institutional Animal Care and Use Committee (IACUC), and myself. The IACUC member nicely laid out the regulations that govern animal research and gave a sincere account of what motivates animal care and research staff – a genuine concern for the welfare of the animals in their care and for the quality of the science to which they contribute. With this setup in hand, I gave my account of research ethics using toxicology as a model. In toxicology, we are at the heart of a debate about the concept of “justifiable harm”. We want to understand why chemicals are toxic and what we can do about it, which means we need evidence of the harm chemicals can cause in biological systems. Using research animals allows us to evaluate potential toxins, piece together how toxicity unfolds, and develop new methods for reducing the risk that those substances pose to humans. While the public generally supports the need to know which chemicals are too risky to use in food, drugs, manufacturing and agriculture, people are often less comfortable with the idea of using animal testing to make that determination. To be sure, there is nothing glamorous about animal research. That said, I fully believe that without it, we would never be able to develop the much needed technologies, drugs, and policies that protect public health and safety. Given that the benefits and ethical costs of animal research are on the collective conscience, animal researchers need to be clear about our intentions and the ways that ethical standards inform our research. As animal researchers, there are many things that we have to do. Our protocols and procedures have to be written, submitted and approved. We have to know, follow and enforce the ethical guidelines provided by funding agencies and institutions. We have to provide adequate justification for our designs and scientific choices, to ensure that the reviewers of our grants, protocols and publications approve of our intentions and our work. Submitting to these requirements makes it sound like our main motivation is to avoid punishment. This could not be further from the truth. Ask any psychologist and they will tell you: a threat of punishment is a poor substitute for clear, tangible benefits of doing the right thing. I can tell you that I follow these standards because my team and I directly benefit from them. When we start a new study, there are many decisions to make, each of which are related to a variety of regulations, theoretical needs and practical realities. Ethical guidelines help us to navigate those decisions, encouraging us to learn the most we can while doing the least harm we can. In addition to protecting animal welfare, this practice raises the standard of research and in turn, motivates us to use the best available research practices, or if necessary, devise new practices for ourselves. How can we design studies to be more ethically sound? The ethical burden (i.e., risk or harm required to answer a question) of a study can always be reduced with better decision-making and design. Strategies to reduce that burden also happen to improve the quality of our science. When we refine our studies to avoid pain and distress for our animals, we also remove variables that hurt the quality of our data and make them harder to interpret. Stress is a major physiological event that affects most outcomes of research interest, from biochemical processes to behavior. If we do not minimize stress, our data may not even answer the research questions we are asking, so minimizing stress is critical to our science. When we reduce the number of animals needed for our studies, we make the studies more time, money, and effort efficient. We do this by selecting or developing stronger methods: using more sensitive measures, generating more data per animal, and selecting more powerful statistical methods. All of this helps to keep our complex projects manageable, our data orderly and trustworthy, and our conclusions clear and strong. When we replace whole animal data with tissue studies (e.g. cell culture) or replace mammal models with lower species (e.g. fish, insects or flatworms) the ethical costs of the research are reduced, as is the complexity of the system we are studying. While some questions can only be answered using living mammals, we should prefer these simpler animal models whenever possible. Our work is easier to ethically justify and provides much needed demonstrations of biological processes in a simple, measurable system. An additional perk to using non-mammalian animals is that we are able to use higher throughput (more data per time/work) procedures that still provide strong evidence. In short, following ethical guidelines for research design make our research more manageable and streamlined, while protecting our data and its value. The broader point here is that we scientists are committed to producing the best quality of research possible, and that means also providing the best welfare possible for our research animals. Studies that require live animals, particularly mammals, should only be performed when the research question cannot be reasonably answered in a more ethical way. They should also only be performed when their purpose justifies the ethical costs, as decided by regulators, funding agencies, and oversight committees. These animals represent a major investment in time, money, and effort for us; and when we provide for the needs of the animals, we expect a better return on that investment: less variability, less bias, and better science. Overall, my talk was well received and I wrapped up my time by answering questions and follow-ups from a number of interested teachers. It is clear that the question of justifying animal research is a difficult one for the public and is a controversial conversation. It is our responsibility as members of the scientific community, to take an active part in that ongoing conversation. My comments were far from a “final answer” on this topic, but I do hope that my perspective and the continued progress of our field of science will give these teachers a good reference for discussing these issues with their classes and continuing the conversation.